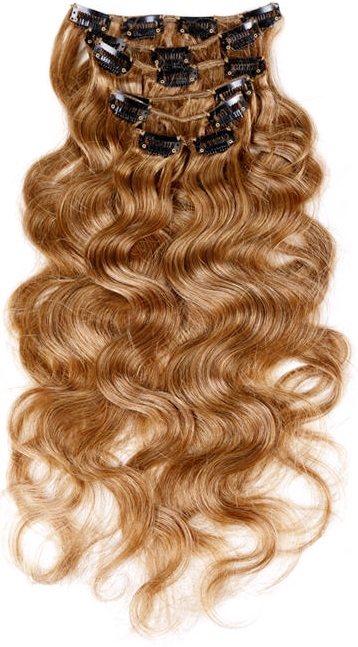 Wavy clip on hair extensions come in a variety of wave patterns. Unlike hair weaves or wigs where there are wide ranges of colours and lengths for each type of wave (water, deep loose body et al) clip in hair extensions tend to have quite a few wave patterns that don't fit neatly into any one category. It's for this reason that we’ve combined the guides for loose and water wave clip in hair extensions under one broad wavy umbrella. 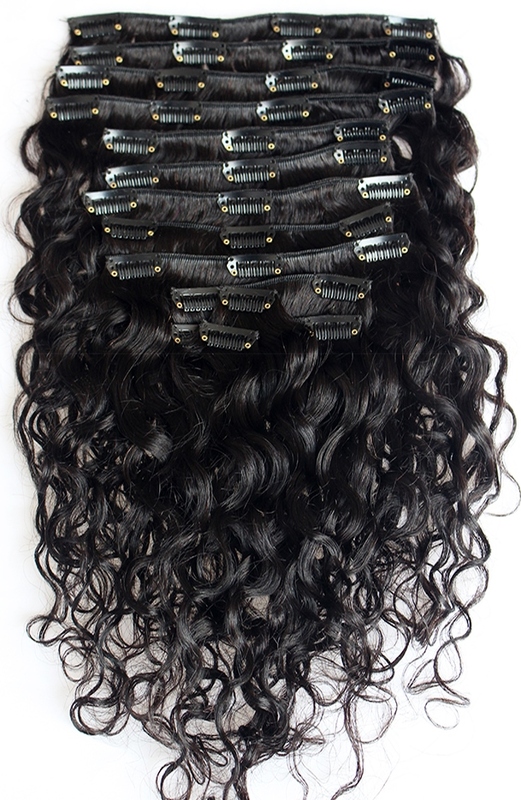 Blending your natural hair with clip in extensions is part of achieving an authentic look. If you have naturally wavy or curly hair you might find it better to find clip in hair extensions with a wave or curl pattern that’s close to your hair texture (unless of course, you like to wear your natural waves and curls straight). Alternatively, you can choose a wave pattern that you like and if necessary use rollers or heat styling tools to marry up your natural hair with the hair extensions. Natural curly heads may find the wavy hair extensions are a touch too glossy and so an alternative may be use waxes or serums to give the natural hair more sheen or use relaxed straight textures (Yaki) and use heat straightening tools to create waves with your natural hair and your hair extensions. Here’s where things get back to the expected and as expected, wavy clip in hair extensions are available as single wefts which can be as narrow as 1 inch and wider wefts which can be up to 9 inches. The wider wefts are worn at the back of the head and up towards the crown whereas the narrower wefts are usually worn at the sides of the head. Multi sets usually have a minimum of seven wefts of varying widths and can have as many as 12 wefts per set. Single wefts (and multi width sets) also come in different weights (thicknesses). The larger clips are often available in different thicknesses (weights), so instead of buying a single 7” piece that weighs 80g you can buy a 7” piece that weighs about 25g and you can check out images of this here. Long serving clip in hair wearers (or novices who’ve read any of our other articles on clip in hair extension textures) will undoubtedly know that the lengths for wavy clip hair extensions range from 8 to 28 inches. Being a long serving member of the Clip In Hair Extension Wearing Community, you won’t be surprised to hear that longer lengths are available and can be found… if you know how and where to look. Wavy clip in hair extensions are available in a cornucopia of colours from jet black through to platinum blonde, T-colours, copper, dip-dye, grey, highlights, green, tricolours, purple, ombre and more besides – hooray! If you’re not sure what hair colours complement you skin tone, then check out our hair extension colour and skin tone guide. Why not peruse Peruke’s Caring For Clip In Hair Extensions Guide and cast your eyes over these top five tips to get started. 1. As the wavy texture has been set permanently set, use a shampoo for chemically treated hair. Repair and strengthen the hair by deep conditioning or using a leave-in conditioner. 2. Limit the use of heat styling tools as these can damage the wave pattern. 3. Keep hair moisturised by using a water-based, mineral oil free moisturizer and seal moisture by applying hair oils to damp hair. 4. Detangle before washing and at the end of washing. 5. Dry the hair in an upright position so the waves return. That's a wrap on wavy clip on hair extensions! If you’d like to know more, check the Hair Extensions Q&A section or keep up with articles about clip hair extensions, wigs, hairpieces and hair weave by joining our blog.